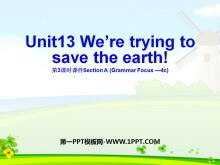 Unit6We're trying to save the earth! 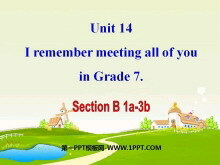 《I remember meeting all of you in Grade 7》PPT课件9 2a Listen to the conversation. Check () the facts you hear. _____ Someone didnt like P.E. 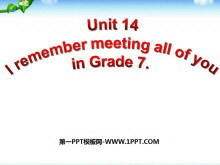 _____ Someone was advised to take a break from running by a teacher..
《I remember meeting all of you in Grade 7》PPT课件8 2a What is the most important thing you have learned in junior high school? Discuss the question with a partner. 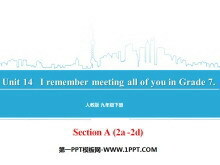 2b Read the passage and answer the questions..
《I remember meeting all of you in Grade 7》PPT课件7 Looking back at these past three years. I remember many things. Trying to be on time for morning readings. 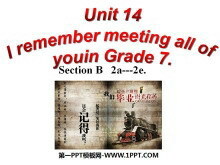 Running when the lunch bell rings 回首过去的三年 ..
《I remember meeting all of you in Grade 7》PPT课件6 objectives To learn the poem I remember To learn some useful words and expressions overcome graduate caring ours look back at make a mess keep ones coo..
《I remember meeting all of you in Grade 7》PPT课件5 Words Review survey n. 调查 standard n. 标准；水平 row n. 一排；一列；一行 in a row 连续几次地 keyboard n. 键盘式乐器；键盘 method n. 方法；措施 instruction ..
《I remember meeting all of you in Grade 7》PPT课件4 warming up Do you have any special memories of junior high school? Which teachers will you miss the most after junior high school? 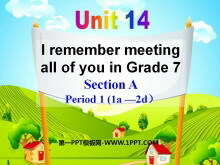 Check () the things you re..
《I remember meeting all of you in Grade 7》PPT课件3 Talk about what you hope to do in the future with your parnter. A: What do you hope to do in the future? B: I hope to get a business degree and become a mana..
《I remember meeting all of you in Grade 7》PPT课件2 Well junior high school days will be over. 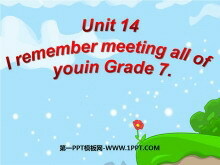 Do you have any special memories? How time flies! Three years has passed. 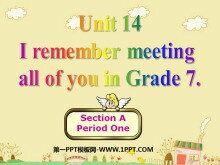 Do you have any special memories about j..
《I remember meeting all of you in Grade 7》PPT课件 Leading-in Look at the following pictureswhat do they remind you of? 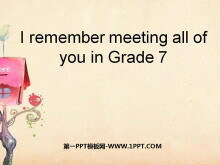 Well junior high school days are over. 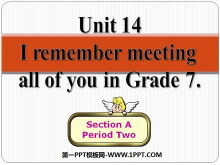 Do you have any special memories? 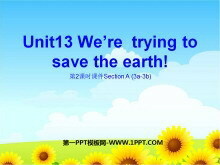 Pairwork A: Juni..
《We're trying to save the earth!》PPT课件7 Read the passage about sharks and complete the fact sheet below. Points in Para 1 hear of 听说 shark fin soup 鱼翅汤 in southern China= in the south of China 在中国南..
《We're trying to save the earth!》PPT课件6 How do you feel? Saving endangered animals is one thing we can do for our world. What else can we do to help save the planet? Noise pollution: loud music planes build..
《We're trying to save the earth!》PPT课件5 Grammar Focus Pay attention to the sentences. 1. 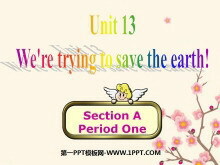 Were trying to save the earth. 2. The river used to be so clean. 3. The air is badly polluted. 4. No scientific studi..